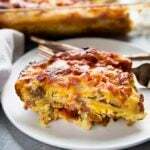 Stacked Tortilla Breakfast Casserole is a fun, easy, and cheesy casserole that can be made ahead! Layers of tortillas are stacked with bacon, sausage, and ham for a mouthwatering brunch! We are pretty obsessed with this new recipe for a good weekend breakfast or brunch! I wanted to do a breakfast casserole that was still easy and full of flavor while being surprisingly fun and creative! This one is really perfect for the upcoming holiday’s! 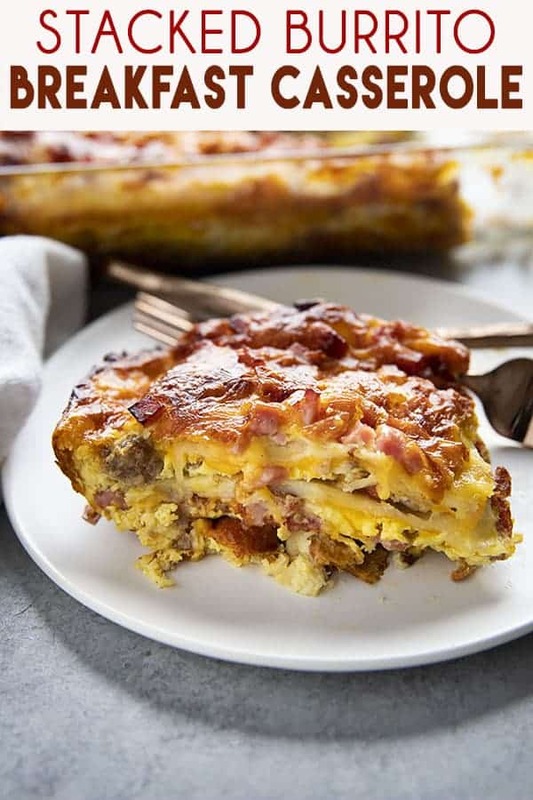 There are so many different ways to make a simple breakfast casserole that your family will love! 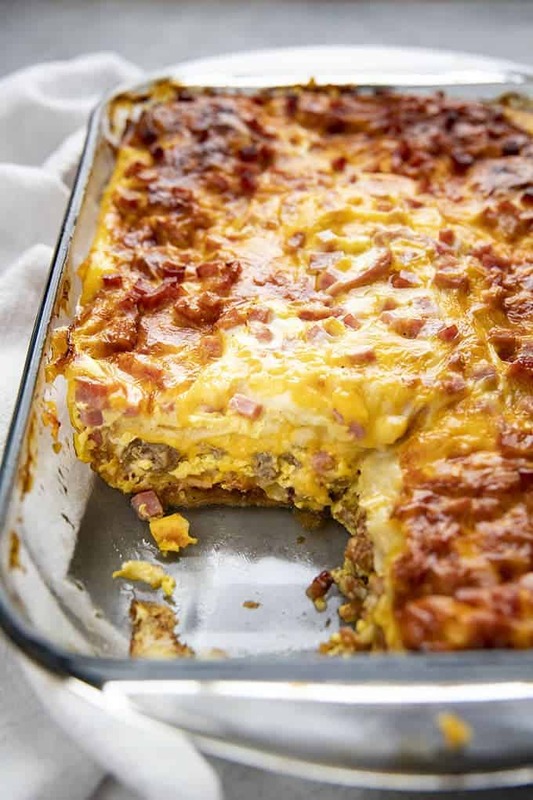 We are already partial to Tater Tot Breakfast Casserole and this easy Bisquick Breakfast Casserole! 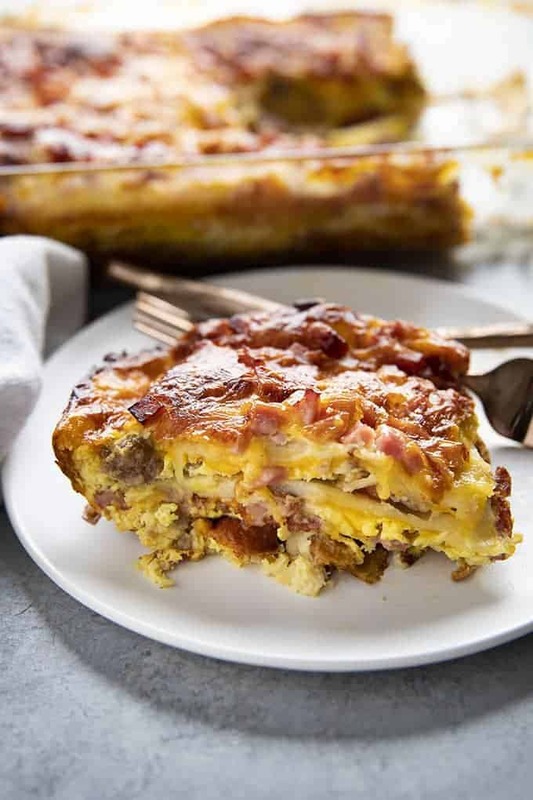 This recipe combines layers of tortillas with sausage, bacon, ham and plenty of cheese! A tasty egg mixture is poured over the top, and then you can either bake your casserole right away or chill for up to 10 hours and bake later. 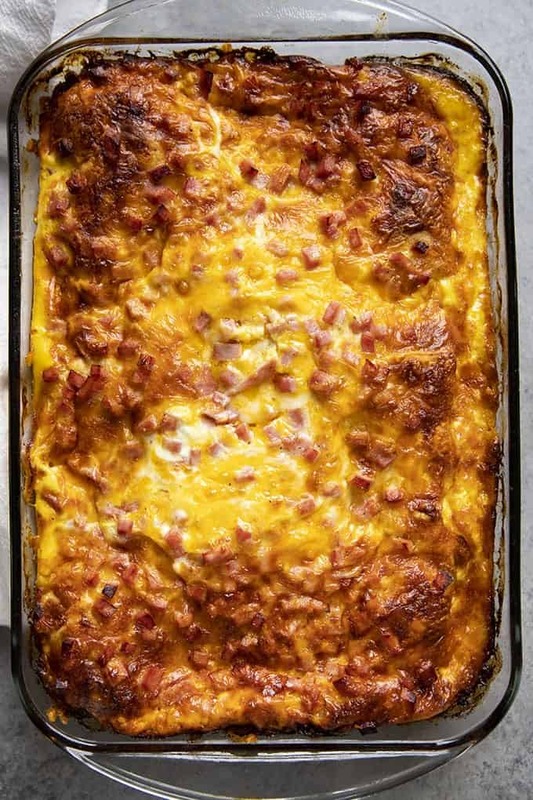 We love to use 3 kinds of meat in this casserole, but, you can use all bacon, ham, or sausage if you prefer. To make this dish, you will want to start with cooking up sliced bacon until slightly crisp. Then, set it aside on a paper towel lined plate and wipe the pan of any grease. Next, go ahead and brown your sausage, breaking it up into crumbles as you cook. Once your meat is cooked you can butter a 9×13 inch baking dish. Preheat your oven to 350 degrees if you plan to make this right away. Cut 10 (10 inch) tortillas in half and layer 1/3 of them in the bottom of the casserole dish, overlapping to fit. Top with a layer of bacon, and a layer of cheese. Next, repeat with another tortilla layer, then sausage and more cheese. Lastly, one more layer of tortillas, then the ham and the last of the cheese. At this point, you can bake right away or cover and refrigerate overnight. Butter a 9x13 inch baking dish with 2 teaspoons of butter or spray with non-stick cooking spray. Layer 1/3 of the tortillas in the bottom of the baking dish and top with the cooked bacon and 1/3 of the cheese. Layer another 1/3 of the tortillas in the dish and top with the cooked and crumbled sausage and another 1/3 of the cheese. Repeat with the last of the tortillas, the ham, and 1/3 of the cheese. In a large bowl whisk together the eggs, milk, salt, pepper, garlic powder, and hot sauce. Cover and refrigerate overnight if desired, or bake right away. Bake, covered with foil oven for 45 minutes. Uncover and bake for 20 more minutes until cheese is fully melted and casserole is cooked through. This is so perfect for Christmas morning!! I wonder what it would be like with corn tortillas ? This looks stunning! I just want to jump right in that picture and eat it! I have the same problem every holiday – I spend so much time preparing and cooking the big meal that we starve all day! I definitely need this and I am not waiting for a holiday to try it!